Dixon Valve & Coupling Company was founded in Philadelphia in 1916. During the 1950's, Dixon pioneered the use of non-metallic hose fittings. The Tuff-Lite line of nylon fittings was revolutionary and had much success in agricultural, food and medical applications through the years. Throughout the 1960's and 70's, Dixon continued to grow by adding branch locations throughout the country in an attempt to provide overnight service to its customers. In 1974, an agreement was made with a leading manufacturer of Wormgear Clamps to sell its products. This venture proved to be extremely successful and was the first major product sold by Dixon that it did not design and manufacture. In 1980, Dixon entered the Cam and Groove market by applying for a patent on a fitting with a safety locking handle. This product became known as "Boss Lock". In 1985, the assets of the Le-Hi Andrews Division of Parker Hannifin were purchased, thus providing Dixon with the Andrews line of Cam and Groove fittings. Dixon is committed to maintaining its role as a leading innovator in the hose and coupling industry and continues to build on their solid foundation and commitment to supply quality hose fittings and accessories. 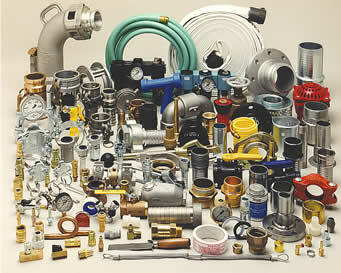 Central States Hose distributes Dixon Valve & Coupling products.